Eamonn Duignan, co-founder of GCR, on the road collecting used clothing for donation. 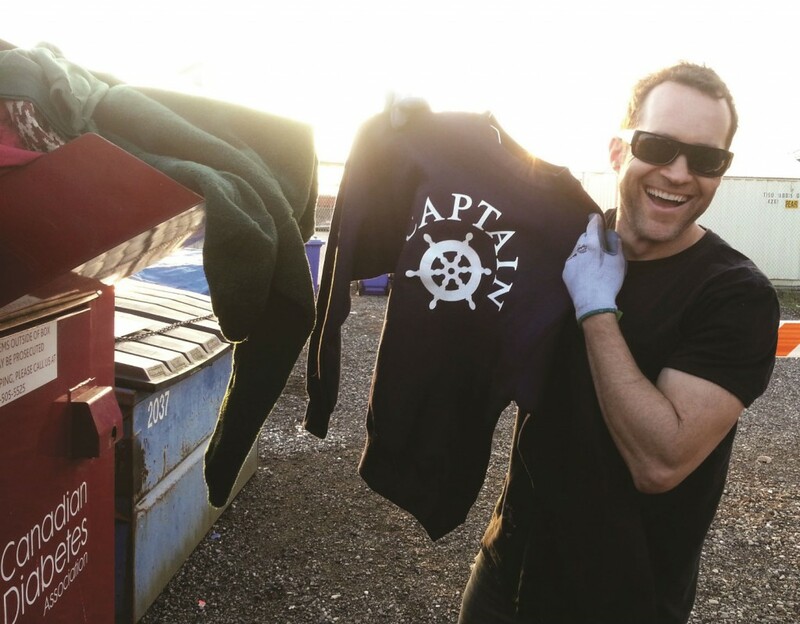 According to Eamonn Duignan, president and CEO, Green Coast Rubbish (GCR), the company has always had a goal to achieve a yearly minimum of 75 percent waste diversion. “Since we started tracking our diversion rates in 2010, Green Coast has either met or exceeded that goal and achieved diversion rates of 86 percent in 2014 and 80 percent in 2015,” he says. Considering Vancouver’s goal for waste diversion is 80 percent by 2020, by meeting or exceeding that mark for two year’s running, GCR is definitely leading the way in the city. In 2015, GCR hauled close to 635 tonnes of material and diverted approximately 505 tonnes of material away from landfill to recycling and re-use. GCR has achieved this goal and is well on their way to achieving Zero Waste. And the community they operate in is taking notice. In June, GCR was presented with a Better Business Bureau Torch Award, which recognizes companies that make big strides in advancing ethics and trust in the marketplace. Overall, during 10 years of operation, Green Coast Rubbish has diverted for recycling and re-use over four million pounds of material. Key to their success so far for Duignan is the creation of a reliable network of partnerships with local businesses that specialize in recycling materials such as foam, drywall, wood, plastic, glass, paint, organics, mattresses and e-waste. Duignan says the establishment of partnerships with recyclers has enabled GCR to streamline the process of materials recovery on all projects. “Basically, we collect all sorts of material, anything from foam, carpet and furniture to concrete and electronics – you name it,” says Duignan. “We form partnerships with a lot of local recyclers where we utilize their facilities in diverting that waste.” As an example, for carpet, GCR has established an exclusive partnership with Vancouver’s only major recycler of the material, Pacific Carpet Recycling. With this partnership, they can now offer clients an option for getting rid of their carpet and underlay with the knowledge that it will be hauled to a certified facility for recycling, not disposed of in landfill. Approximately 80 million pounds of used carpet and underlay are sent to Metro Vancouver’s landfills each year on average. Other key recycling partners for GCR from the Vancouver area include: Harvest Power for organics; New West Gypsum for drywall; Cascades Recycling for cardboard and paper; Urban Wood Waste Recyclers for wood and wood by-product; Blue Planet Recycling for plastic and glass; MattressRecycling.ca for mattresses and couches; EPS Styrofoam for foam; Davis Trading for metals; Encorp Pacific for electronics; and Regeneration for paint, oil, gas, pesticides and propane. For many clients, GCR also specializes in custom waste diversion solutions. One recent example was a oneday drop off recycling event for cabin owners on Indian Arm, a water-access only community near Vancouver. Even more recently, GCR developed and rolled out a unique binder recycling program for commercial clients. The company has also done very well with deconstruction services for industrial clients, which Duignan says has played a significant part in helping increase construction waste recovery rates in Vancouver. Besides collecting and hauling recyclables to their partners, helping to supply the recycling industry with needed materials, a large percentage of items GCR recovers and diverts from landfill end up in the re-use stream. “We just celebrated our tenth year in business in May. My brother and I, Cein Duignan, founded the business back in 2006. I was actually working in the industry about three years before we started Green Coast, which was my introduction into the industry. I had no idea what junk and waste removal was all about. I learned the industry as I went. When I started, three years before establishing GCR, it was simply A to B pickup, and then material was hauled to landfill. There was really no thought about recyclables and diversion. After three years, we decided to do it ourselves, and do it better and with a focus on waste diversion. Ten years later, GCR has half-adozen regular employees and four trucks, the majority with about 20 yards hauling capacity. On days when they need additional help for particular projects, they rely on a locally-based casual labour pool. For their fleet of trucks, GCR uses biodiesel, which has provided some advantages and some challenges. “It’s definitely been a learning curve with biodiesel. It is harder on our trucks in general, so we’ve been experimenting with different blends and different carriers. But all in all, we’ve had success with it. We’re always looking for other options, but for right now biodiesel is the most viable for us. It’s another piece of the bigger picture of who we are as a company. For e-waste GCR utilizes EnCorp, which is regulated by the government, so GCR and their clients can be confident that electronics are being recycled responsibly, meaning for one thing, that none is sent overseas for illegal dumping. For their recently established binder recycling program, GCR utilizes local recyclers for the cardboard and metal, and vinyl goes to Blue Planet in Langley, B.C. According to Duignan, 2014, with their diversion rate of 86 percent of waste collected, was the company’s best year to date. In terms of profitability, GCR reports sales growth over 42 percent last year and says they are on track for 39 percent in 2016. “Landfill space is becoming a premium and it’s all shifting from defining things as waste material to defining them as resource material – seeing value in the things that we throw out,” says Duignan. “The future is definitely in the re-use of products combined with the recycling of materials. The biggest change we’ve seen in 10 years is society’s shifting attitudes towards waste. A decade ago we saw this starting to happen, and it’s positioned us well to be ahead of the curve. “Re-use and recycling potential is now much more recognized. Ten years ago, did we hear about a sustainability officer in a large corporation? Sustainable, environmentally sound waste management is now on the radar of every company. And if it’s not, it will be and it definitely should be. “For growth, key for us is just keeping at it and trying to do what we can for the community, as well as just simply listening to what our clients want and delivering on those needs. Our clients don’t want things landfilled. They want peace of mind that they’re doing the right thing and that their reusable and recyclable products and materials are going to the right spot. And they receive a certificate to prove it. “The next 10 years, in this industry as a whole, I anticipate seeing increased regulations, and more programs, facilities and options for environmentally sound waste management. One of our biggest challenges currently is a lack of facilities. Still, it has certainly improved – the amount of options has grown over the last 10 years – and it will continue to change. “For us, in the next ten years, we plan to establish a waste lab and recycle centre, so we’ll be able to deal with hard to recycle items we collect, and we’ll have a place to warehouse materials that are reusable. People in the community will be able to come and take advantage of what we have in stock. This article was originally published in the July/August 2016 edition of Recycling Product News. GCR’s fleet runs on biodiesel, for collecting and hauling everything from mattresses to scrap metal. Green Coast Rubbish staff on the job providing customized waste collection and hauling. GCR diverted more than 500 tonnes of material to recycling and re-use in 2015.